The Toy Retailers Association has publsihed a list of the top toys that they expect to be most popular for Christmas. Answer the call of the Brawl and decide the fate of the galaxy! These small spheres magnetically morph into powerful Bakugan warriors when they roll onto the real metal Gate Cards! Use strategy to place your metal Gate Cards effectively as each card affects the battle differently. Then master your precision shooting skills to roll your Bakugan into battle and win! Battle pack includes: 6 Bakugan Marbles, 8 Metal Cards: includes 3 normal cards, 2 character cards, 2 command cards Special Foil Card- special ability card. Battle Strikers are the next generation of battling tops. Power up the Turbo Launcher to more than 6300 RPMs. Engage in battle and utilize the ‘Controller’ to battle your opponent. Re-power your Striker through magnetic connectivity to continue your battle. Includes exclusive Tsunami Striker. With 4 to collect, make playtime more fun with interactive realistic hamsters. They are artificially intelligent hamsters that talk and move around their habitat. Pipsqueak, the braniac of the group, is super sweet and smart. Watch GX Racers perform an incredible stunt and defy everything you thought possible about vehicles! Even on four wheels, the gyroscopic extreme racers can run a tightrope, high above the ground. This is the perfect addition to any stunt course. Take and edit pictures, make videos and play games with this ultra tough digital camera! Featuring easy to use controls, viewfinder, flash and colour LCD screen. Links to the TV or PC, allowing you to view and edit photos or watch videos. This version of Monopoly adds entirely new strategies to the game, with more than 80 plastic structures available to players, including industrial blocks, stadiums, skyscrapers and parks. One of the new twists is that you can negatively impact other players’ property values by building undesirable structures nearby. This amazing palace is a home fit for Princess Peppa! Her beautiful palace folds out to reveal a banqueting hall and many other rooms and accessories including thrones, beds, table, chairs, an oven cauldron, and an exclusive guardsmen to protect Peppa and her Royal Family! Open up the roof and side to reveal a very well equipped kitchen area with sink, stove, drawers, cupboards and even a fold-out ironing board. There’s a seating area which converts into a double bed and coffee table. There are 2 further fold-out bunks on board. Towards the rear there’s a shower room with fold-down loo and a wash-hand basin. The Caravan is designed to be towed by the Family Saloon Car, sold separately. Transformers 2: Revenge Of The Fallen is the 2009 sequel to the smash hit 2007 live action movie starring the hugely popular 80’s toys. From the moment Optimus Prime took Earth as a new home for himself and his people, he was rededicated to its protection. Since that day, he has focused all of his considerable will and power on rooting out the last few Decepticons and destroying them. To that end, he has upgraded and refined his sensor suite, and trained with Ironhide in tracking the evil robots. Prepare to do battle – Autobots style! Gear up with the good guys and fire either of two missiles from this mighty leader’s firing cannons in robot mode. 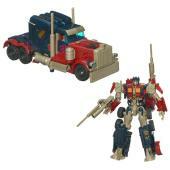 Or convert to tough truck mode turn the smokestack into cannons! Either way, you’re armed for battle! The only question is: are you ready? Detailed robot-to-vehicle figure features double-missile firing cannons in robot mode and a smokestack that converts to cannons in truck mode!